Last week I wrote about Michter’s US 1 Rye. Today, I look at another whiskey from the Michter’s label: the 10-Year-Old Single Barrel Bourbon. Like it’s rye counterpart, this one wasn’t actually made at Michter’s Distillery in Schaefferstown, Pennsylvania (which last made A.H. Hirsh 16-Year-Old Bourbon). Just because this bourbon isn’t made at the historic Pennsylvania distillery doesn’t mean it isn’t a great spirit. But the fact that bourbon was made in Pennsylvania does let me address one common misconception: Contrary to what you might have heard (and what a friendly bartender recently tried to convince me of), bourbon doesn’t need to made in Kentucky. While the standards for bourbon are quite exacting, there is no requirement as to where it is made, and these days fine bourbon is made in New York, Virginia, Kentucky, and elsewhere—though Bourbon County, Kentucky, remains the center of production. For a whiskey to be considered bourbon, it must only meet the following standards (laid out in 1964 U.S. law). It must: (1) be made of a grain mixture that is at least 51% corn; (2) be distilled to no more than 160 proof; (3) be natural with nothing other than water added to the grain mixture; (4) be aged in new, charred oak barrels; and (5) not be introduced to the barrel at higher than 125 proof. Additionally, bourbons aged for less than four years must be labeled with thier age, meaning that most bourbons are at least four years old. With a smokey copper appearance and an intense nose of oak, the taste is dominated by charred oak and malted barley with orange peel and a hint of anise. The finish is cedary and long. Overall, this is a complex and pleasant bourbon. I find the price of around $60, however, to be a little high. Were it half that I could offer an enthusiastic recommendation. 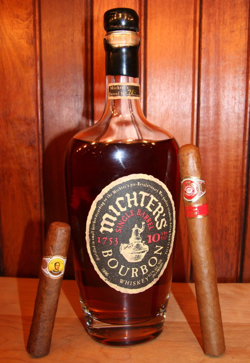 Either way, Michter’s 1o-Year-Old makes a fine pairing for any good medium- to full-bodied cigar. I found the flavorful Cuban Bolivar Royal Corona to be a perfect match. Are you purchasing this at your local liquor store or off the internet? I have a great liquor store but they don’t carry anything from Michters. I actually didn’t purchase these myself. They come from my father’s spirit collection, from which I tried a number of whiskeys during a recent visit. He purchases them in New York City, but beyond that I don’t know the specifics. I know that no Virginia state liquor store I’ve ever been to carries any Michter’s. Michter’s is available in MD also. I have seen it on numerous occasions at fine liquor stores throughout the Baltimore Metro area. Never purchased it though. I am still waiting to sample the genuine article from PA first. There are zero distilleries in Bourbon County, Ky today. Other than that, your bourbon info was correct. All of the Michter's products come from whatever distillery will sell them whiskey.